Kone, a global leader in elevator and escalator technology, is implementing a contract that will see it deliver several hundred people-flow units to the King Abdulaziz International Airport (KAIA) project in the Red Sea port city of Jeddah. The company’s participation includes the delivery of 300 elevators, 134 escalators and 127 autowalks for the airport which is going through a very extensive modernisation phase. The other project that Kone is working on is the 170-storey Kingdom Tower, which will become the tallest building at more than 1 km when completed. Last May, Kone announced it had initiated the very first phases of its elevator installation at the Kingdom Tower construction site. A project team is working on pre-installation activities concerning the fitting of the elevator system’s guiderails, which will be installed towards the end of the year. The installation of the guiderails as well as the eventual installation of the Kone elevator cars will then progress as the Kingdom Tower’s central structure rises over the coming years. The next phase will cover the manufacturing and delivery of Kone’s vertical transportation solutions. The company is delivering uniquely advanced technology: the world’s fastest and highest DoubleDeck elevators, supported by the revolutionary Kone UltraRope technology, as well as the latest people flow intelligence solutions. Kone is offering capability to travel at a seed of over 10 m per second with DoubleDeck elevators to reach the highest liveable floor in the world in 52 seconds. Additionally, the high-speed elevators will rise 660 m to the observation deck, making it the world’s highest elevator rise. The use of Kone UltraRope, which is one-third the weight of traditional ropes, will make it possible to fit the DoubleDeck elevators with normal machines, an advantage that will enhance the sustainability of Kingdom Tower, consuming much less power. The Kingdom Tower project is owned and developed by Jeddah Economic Company (JEC). JEC’s founders are Kingdom Holding Company, chaired by HRH Prince Al Waleed Bin Talal; Abrar Holding Company, represented by Samaul Bakhsh; Kela’a Jeddah Company, represented by businessman Abdulrahman Hassan Sharbatly, and The Kingdom Tower’s primary contractor, Saudi Bin Ladin Group, represented by Saleh Bin Ladin. JEC’s capital has a book value of nearly SR9 billion ($2.4 billion). One of Kone’s recently completed projects in Jeddah was Headquarters Business Park, designed to be an exemplary development with intelligent features. Clad in glass and local limestone, the site comprises two towers. The 70 m east tower houses a hotel; while the 250 m west tower features offices, sky villas and a fine-dining establishment at the top. The towers are linked by an eight-storey elevated parking podium, with landscaped rooftop on which the 52-storey west tower is poised. 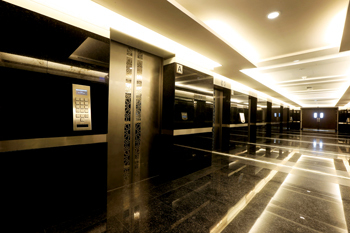 To facilitate such a tight timetable, two construction time use (CTU) elevators were installed. Kone CTU elevators are permanent elevators, equipped with temporary signalisation and protective materials and used during the construction phase. These elevators speed up the transportation of workers, goods and tools, thus saving hundreds of man hours – plus use 30 per cent less energy than external hoists. “The Kone CTU elevators were a major factor in the customer selecting Kone as a partner on this project,” said Odeh. The official noted that the people flow criteria required limited access to certain floors. To determine optimal traffic flow, Kone experts conducted two people flow studies. Their recommendation was for three types of access levels that are integrated to the Kone Polaris Destination Control System (DCS). “With DCS, we were able to incorporate touchscreen technology where the passenger uses a keycard to access the system and is then guided directly to a dedicated car, all the while maintaining a minimum wait at peak times,” explained Odeh. 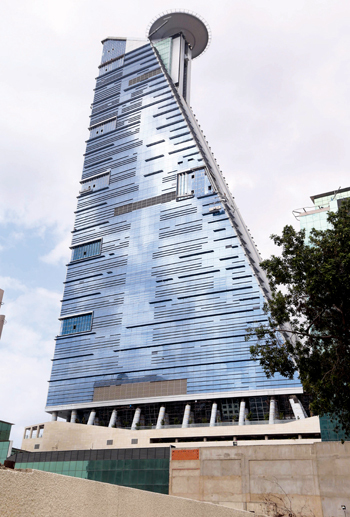 The Headquarters Business Park’s west tower has 52 storeys and its east tower 13 storeys. Kone provided its trademarked equipment and systems including 13 MiniSpace and 18 MonoSpace elevators, two TransitMaster 120 escalators, a Polaris Destination Control System, an E-Link monitoring system and a Care Maintenance Service.